I am a big fan of juicing – let me make that perfectly clear! If you decide to juice, definitely make your own – do not bother buying bottled – or God forbid – canned juices. Your cells will be so happy to receive food with the highest amount of life energy available! There are many fancy juicers on the market. The one I recommend – the Jack Lalanne Juicer – is inexpensive and from an old-time fitness expert, the guy who swam the English channel tugging a barge behind him. I like his juicer because it’s easy – it has a wide mouth so you don’t have to spend the majority of your day chopping your vegetables into little pieces, plus you can put it in the dishwasher when you are done so you don’t spend what’s left of your day washing each little part. Many people complain they don’t have time to juice – you do! When clients complain about not having time to do the job, I simply take them up to my kitchen and whip up a delicious glass of juice in about 2 minutes. 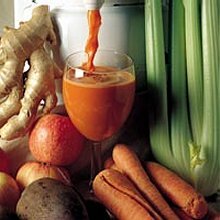 If you are new to juicing, I recommend you start with what I refer to as a “beginner juice” – carrots, celery and apple. Another great juice that just about everyone enjoys is fresh organic lemonade. Buy a bag of organic lemons at your local health food store. Wash them and cut off the ends, but be sure to leave on the peels – the pectin in the peels is great for your liver. Run the lemons through your juice and save the juice in a large jar. When you are ready for fresh lemonade, take 1-2 ounces of lemon juice, add the natural sweetener stevia to taste and fill the rest of your glass with filtered or sparkling water. Voila! The best lemonade you have ever tasted. There are many recipes and many books about juicing, but the general thought is simple. Half your glass should taste good. The other half should be good for you. So, for example, half your glass could be fresh organic apple or pear or pineapple juice. The fruit juice will cover up the taste of the sharper vegetables like spinach or kale. My favorite juice is celery, apple and parsley. and a healthy fat – your juice supplies your vegetables and healthy carbohydrates. time and I have tons of energy!